Given the increasing acceptance and prevalence of cannabis as a therapeutic option, it’s important for physicians and patients to understand how various cannabis components interact with commonly consumed pharmaceuticals. New: This report is now available in Spanish and Japanese translations! See bottom of this article for downloads. Project CBD, a California-based educational non-profit, has published an in-depth primer on Cannabinoid-Drug Interactions for health professionals, patients, and public policy-makers. The 33-page report, summarized below, is available for free download at the bottom of the page. Drug interactions are a significant consideration in modern medicine. More than half of U.S. adults regularly take prescription meds and at least 75 percent of Americans take at least one over-the-counter drug. Many people, including most seniors (the fastest growing demographic of cannabis users), take multiple drugs, and these compounds can interact and affect the metabolism of each other. Cannabis is one of the most widely consumed substances in the United States and throughout the world, and a huge number of cannabis users also consume pharmaceutical products. Given the increasing acceptance and prevalence of cannabis as a therapeutic option, it’s important for physicians and patients to understand how various cannabis components, including cannabidiol (CBD) and tetrahydrocannabinol (THC), the major phytocannabinoids, may interact with commonly consumed pharmaceuticals. But pertinent information about cannabinoid-drug interactions is difficult to obtain because of marijuana prohibition and consequent restrictions on clinically relevant research. Hence the need for Project CBD’s primer, which was written not only to help health professionals and patients anticipate and avoid problematic outcomes but also to take advantage of situations where cannabis and pharmaceuticals can act synergistically in a positive way. The Project CBD primer includes a discussion of various “substrates” or drugs that are metabolized by cytochrome P450, a large family of non-specific enzymes that are involved in breaking down an estimated 60 to 80 percent of all pharmaceuticals. Cytochrome P450 enzymes may be inhibited or amplified by CBD, THC and other plant cannabinoids, thereby reducing or prolonging the activity of another drug. By suppressing or inducing specific cytochrome P450 enzymes, CBD and THC can alter how one metabolizes a wide range of substances. Much depends on the particular substrate involved in the drug interaction. Some pharmaceuticals, known as “prodrugs,” don’t become functional until they are metabolized into an active component. If CBD or THC inhibits the breakdown of a prodrug, the latter will remain inactive – whereas inhibiting the metabolism of a regular drug will result in higher blood levels of the active substance. Several variables make precise predictions about drug interactions difficult, even for practiced physicians. “It is much easier to assess whether drug interactions are likely than to predict their exact effect,” the Project CBD primer asserts. Thus far, based on observations regarding the widespread use of raw cannabis flower and full-spectrum cannabis oil, it does not appear that there have been many problems because of cannabinoid-drug interactions. The clinical use of Sativex (a 1:1 CBD:THC sublingual tincture) and Marinol (a pure, synthetic THC pill) has resulted in few, if any, reported adverse events attributable specifically to interactions with pharmaceuticals. To the extent that there have been problematic drug interactions with cannabinoids, these have involved high doses of nearly pure CBD isolates, not cannabis in general. Even though THC is an intoxicant and CBD is not, the fact that people tend to use much higher doses of pure CBD makes it a much riskier player in metabolic drug interactions. Consider the numbers: Ten milligrams of THC in a cannabis product is a hefty dose for a naïve patient and sufficiently psychoactive for the occasional recreational user. Ten mgs of THC combined with an equal amount of CBD in a Sativex tincture hit the analgesic sweet spot in clinical trials. These are moderate doses compared to the amount of single-molecule CBD administered to epileptic children in clinical trials – up to 50 mg per kilogram – with CBD doses as high as 2000 mg not uncommon among patients who obtain CBD isolates from internet storefronts and other unregulated sources. THC has its own built-in guard rails – consume too much and you’ll know you’ve hit your limit. With CBD, there are no guard rails, no dysphoric feedback loop that says you’ve had enough. CBD is intrinsically safe, but when extracted from the plant and concentrated as an isolate, high doses are necessary for therapeutic efficacy – unlike whole plant CBD-rich extracts, which have a broader therapeutic window and are effective at lower doses than single-molecule CBD. Drug interactions are much more likely with high dose CBD therapy than other forms of cannabis consumption. Physicians and patients should be concerned about this, given that the current regulatory regime privileges CBD isolates over artisanal, plant-derived, multicomponent formulations. The way cannabinoids are administered (smoking, eating, etc.) also has a major impact on whether or not drug interactions occur. Interactions are far more likely when both drugs are taken orally and processed by the liver before being distributed through the body. Cannabinoids are absorbed more if ingested on a full stomach. Ingested cannabinoids will have higher peak liver concentrations than inhaled cannabinoids, so ingested cannabinoids should have more potent drug interactions. The Project CBD primer notes that the sequence as well as the route of administering cannabidiol can influence how another drug is metabolized. One study disclosed that CBD has a stronger inhibitory impact on a particular cytochrome P450 enzyme if it’s administered 20 minutes before the second drug. CBD also interacts with THC. By taking CBD and THC together, individuals may find that the effects of THC are tempered but prolonged slightly. It is known that 11-OH-THC, a THC breakdown component, is more potent than THC at the CB1 cannabinoid receptor, which mediates psychoactivity. 11-COOH-THC, another THC metabolite, has anti-inflammatory effects without causing a high. Some people can hardly tolerate any THC. The wide range of reactions to THC-rich cannabis may be influenced by genetic factors. A common polymorphism (or variant) of a gene that encodes a particular cytochrome P450 enzyme alters how one metabolizes THC so it breaks down more slowly and stays active longer, resulting in hypersensitivity to THC’s psychoactive effects. That may be one of the reasons why some people find THC-rich cannabis to be unpleasant, while hundreds of millions smoke it to relax. This genetic variant exists among 20% in European & Middle Eastern populations, meaning one in five Caucasians are THC-averse. Less than 10% of Africans have this genetic variant and among Asians it’s less than 5%. THC v. lung cancer. When cannabis is smoked, cytochrome P450 enzymes in the lungs convert inhaled ash into potent carcinogens, including highly toxic polycyclic aromatic hydrocarbons (PAHs). But THC may protect against lung cancer by inhibiting the same metabolic enzymes that PAHs induce. 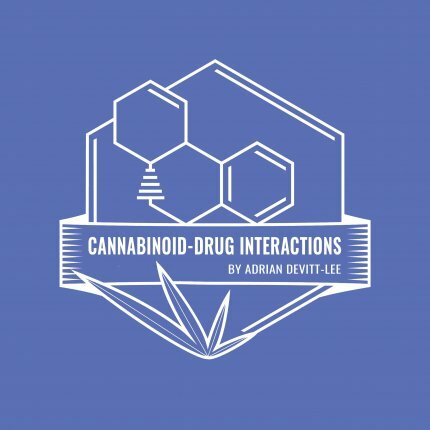 Cannabinoid-opiate interactions. Supplementing an opioid-based pain-management regimen with cannabis could result in lower doses of opioids required for adequate analgesia. Lower doses of opioids will reduce the number of overdose deaths. This is an example of a potentially beneficial cannabinoid-drug interaction. CBD, THC & chemotherapy. Limited preclinical research indicates that administering CBD and/or THC in conjunction with first-line chemotherapy drugs could potentiate the latter, thereby reducing the dosage of highly toxic chemo necessary to treat the cancer. If this translates to human experience, it would be a huge benefit. But if pure CBD delays chemo metabolism, dangerously high levels of a toxic drug could accumulate unless the dose of chemotherapy is reduced and properly managed. The fact that cannabinoids make radiation and chemotherapy both more tolerable and seemingly more effective is an area worth studying. Blood thinners. Both THC and CBD delay the metabolism of warfarin, a widely prescribed blood thinner. Mis-dosing warfarin causes tens of thousands of ER visits every year because of excessive bleeding. The Project CBD primer reviews a recent case study as an example of how physicians can successfully adjust the dose of warfarin for a patient who is also taking a CBD isolate. The information presented in the Project CBD primer is intended to help doctors and patients understand if and when drug interactions with cannabis or cannabinoids are likely. “It is not meant to stoke fears about drug interactions or add to decades of ill-advised, anti-marijuana hysteria,” the author emphasizes. How dangerous are cannabinoid-drug interactions? As dangerous as mis-dosing the other drug(s) that a patient is taking. Problems are more likely to arise when a patient combines a high dose of an otherwise benign CBD isolate with a pharmaceutical that has a very narrow window between its therapeutic and toxic levels. In GW Pharmaceuticals’ clinical trials of Epidiolex, an almost pure CBD compound, there were potentially dangerous interactions with Clobazam, an anti-epilpetic drug, which necessitated a dosage adjustment of the latter. The FDA recently approved Epidiolex as a medication for children with refractory seizure disorders. And the DEA classified Epidiolex as a schedule V substance in September 2018. Epidiolex would surely command a lot of “off label” attention if not for the potent price tag. And just as surely a huge unregulated market for hemp-derived CBD isolates will continue to flourish in a tenuous legal environment. An already massive consumer demand for CBD products has far outpaced the gathering of clinical data on cannabinoid interactions with pharmaceuticals for pain, cancer, autism, heart disease and many other chronic ailments. The longstanding barrier to requisite research is the Schedule I status of cannabis, a category reserved for dangerous substances with no medical value, according to federal law. But the paucity of federally sanctioned clinical research, a consequence of cannabis prohibition, should not be an excuse for physicians or patients to shun nonlethal cannabinoid therapies, which show promise for a wide range of conditions.